Vaughan Merlyn argues that attempts to improve collaboration and support knowledge management within IT organisations have typically met with limited success. He believes that limitations with collaboration platforms are a key factor in these disappointing results and that a ‘one-size-fits-all’ approach is doomed to failure. Some aspects of IT require a highly structured and tightly governed approach to enabling collaboration, while others work best with a looser and more emergent approach. Vaughan explains why and how a Semantic Wiki approach provides a powerful solution for IT collaboration. A wiki invites all users to edit any page or to create new pages within the wiki website, using only a plain-vanilla web browser without any extra add-ons. A wiki is not a carefully crafted site for casual visitors. Instead, it seeks to involve the visitor in an ongoing process of creation and collaboration that constantly changes the website landscape. As an inherently web-based concept, wikis benefit from evolving web standards and technologies such as browsers, mark-up languages and even the magical world of open source – enabling wiki users and developers to participate easily in a rapidly growing ecosystem of plug-ins. But these strengths also create vulnerabilities. For example, the ease with which users can create and edit pages can quickly lead to a chaotic free-for-all, as content becomes subject to the whims of authors and editors, and, with the absence of a meaningful underlying structure, pages proliferate. The lack of review before modifications are accepted can limit the credibility of a given wiki page. A process definition, for example, may have been last edited by someone who introduced a serious error – and that error can proliferate as people refer to and use the process with the assumption that the content on the page is valid. Sites such as Wikipedia mitigate these vulnerabilities through a robust system of editorial administration, oversight and management – enhanced by the ‘law of large numbers’. In this case, with a sufficiently large universe of editors, the content of any page quickly converges towards a mean, reflecting ‘the wisdom of the crowd’. But with an internal wiki – say one used by an IT organisation or other shared services function, the law of large numbers does not apply, so without other mechanisms to manage structure and content, the wiki degrades in quality and value over time. SharePoint as a common culprit! This degradation is commonplace in organisations using Microsoft SharePoint as their collaboration or knowledge management platform. While typically deployed to support collaboration, the reality quickly scales back to ‘a place to store documents’, which, in the words of one of my clients, soon degenerates to, “a place to lose documents!”. But all is not lost, as the world of Web 2.0 gives way to Web 3.0, tapping into the special properties of the Semantic Web, a term first coined by Tim Berners-Lee. Tim was the inventor of the World Wide Web and is director of the World Wide Web Consortium (W3C), which oversees the development of proposed Semantic Web standards. Berners-Lee defines the Semantic Web as “a web of data that can be processed directly and indirectly by machines”. A Semantic Web goes beyond the traditional web concept of hyperlinked, human-readable web pages by inserting machine-readable metadata about pages and how they are related to each other. This enables automated agents to access the web more intelligently and perform tasks on behalf of users. In some respects, the Semantic Web is designed to overcome the all too familiar limitations of today’s web – a proliferation of untrustworthy content that can be hard to navigate and make sense of. Building on the Semantic Web concept and standards, a Semantic Wiki has an underlying model of the knowledge described in its pages, thereby capturing the meaning of the data within the wiki. Having these semantic properties explicitly defined enables wiki governance rules and workflows – for example, someone defining a new process will be prompted to define the associated competencies needed for that process, and an appropriate template can be automatically loaded for defining those competencies, thereby encouraging consistency and quality. A simple query can highlight roles that are missing, or identify associates who are qualified to fill a given role. Several wiki platforms offer semantic extensions, including Semantic MediaWiki (which extends MediaWiki, the underlying open source platform that powers Wikipedia) and zAgile’s Wikidsmart extension to the popular and powerful Confluence platform. In combination with other plug-ins and extensions, such as Page Rating, Social Reputation, Workflow and Task Management, a Semantic Wiki can enable real and meaningful collaboration and knowledge management for IT organisations (or any other environment where collaboration can improve service quality, speed of delivery and organisational clarity). 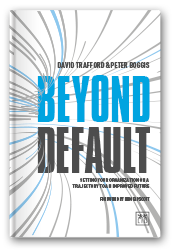 Core capabilities comprising the critical processes, assets and structures that help run the day-to-day business. Edge capabilities where innovation, growth and change are cultivated. These distinct value propositions have operating model implications, requiring distinct forms of semantic wiki-enablement, as highlighted in the table below. Core capabilities such as data centre operations and service management depend upon processes that are standardised, tightly controlled and centrally planned. Management systems for these types of capability must focus on integrated, reliable, efficient processes and compliance to norms. A wiki that supports core capabilities must be highly ordered and globally governed. For example, each process should have a ‘process owner,’ with clearly defined accountabilities for maintaining and continuously improving their processes. They need defined workflow mechanisms, for example, to control the promotion of a material change to a process page from ‘draft’ to ‘pending approval’ to ‘approved’ to ‘operational’. Edge capabilities, on the other hand, depend upon structures that are loosely knitted, with agile processes that can rapidly adjust to entrepreneurial initiatives and fast-shifting technologies. Management systems and organisational culture must foster new product success and the experimentation needed to get there. Whereas core capabilities epitomise highly ordered environments, the edge represents the place where chaos and order meet and creativity blossoms. A wiki that facilitates edge capabilities works best with limited structure and control, where, to paraphrase China’s Chairman Mao Zedong, “one thousand flowers bloom”. Here the underlying semantic model will be centred on problem areas and the process of ideation, with business relationship managers, product managers and architects as the natural choice for the wiki’s points of control. 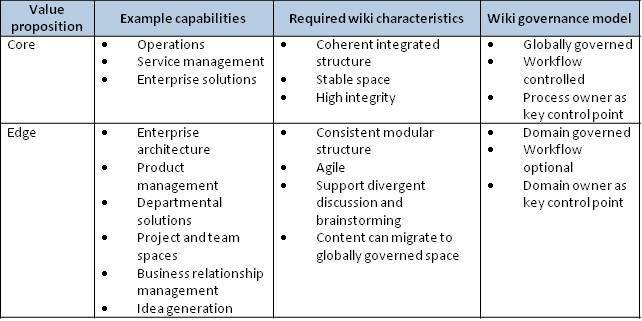 IT organisational needs can be comfortably addressed in a single Semantic Wiki, with each value proposition having its own underlying semantic model and associated governance structure. 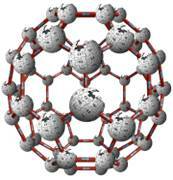 Having both ‘core’ and ‘edge’ capabilities supported in the same wiki space affords important benefits. For example, everything is discoverable and linkable across the models. These characteristics are all but impossible to achieve in a traditional document-centric collaboration approach. If the primary goal of the core is to ‘prevent bad change’, a tightly structured Semantic Wiki with a robust governance model is a powerful way to support this goal and the organisations that must deliver against it. If the primary goal of the edge is to ‘create good change’, a loosely governed Semantic Wiki with ‘sandboxes’ to generate and test ideas is a great way to support this goal. Today’s leading wiki platforms, with their semantic extensions offer a single, integrated solution that can help drive IT organisational clarity and improve performance.